HITACHI ANNOUNCES ENHANCEMENT OF ITS INNOVATIVE SMALL CHARACTER INKJET PRINTERS : News Releases : Hitachi America, Ltd.
TARRYTOWN, NY, July 20, 2006-- Hitachi America, Ltd., Industrial Systems Division, today announced further enhancement of its world’s most advanced small character inkjet printers. Hitachi has been building small character inkjet printers since 1975. The PX Series small character inkjet printers was originally designed and introduced in 2003 to provide the best price-point feature to feature. The enhanced PXR Series small character inkjet printers will keep the same best features with more friendly features environmentally and operationally. The PXR Series small character inkjet printers will fully meet new European RoHS Directive (Restriction on Hazardous Substances, Directive 2002/95/EC), which will be enforced as of July 1, 2006 in EC countries. RoHS Directive prohibits that electrical and electronic equipment contains lead, mercury, cadmium, hexavalent chromium, polybrominated biphenyls (PBB) or polybrominated diphenyl ethers (PBDE). The PX Series small character inkjet printers deploy a 10.4” large Color LCD Touch Panel with full guidance on the screen providing easy and quick operation and maintenance. The new PXR Series small character inkjet printers screen will have 25%+ brightness and more than 10 times the contrast with 50%+ viewing angle. 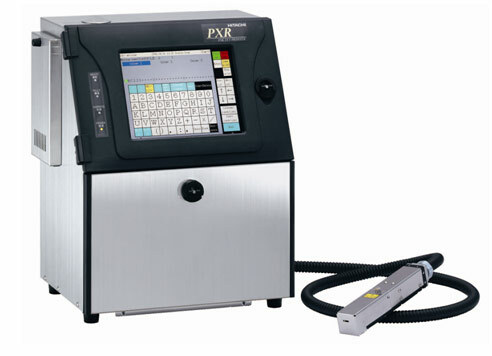 The PX Series small character inkjet printers’ unique and innovative ink circulation system helps reduce fluid evaporation and achieves a very low cost of operation. Nozzle and gutter are automatically cleaned before shut down, so no special procedures are required on start-up. The PX Series small character inkjet printers viscosity and density control provides stable ink drop formation and keeps print quality high. The IP55 rated stainless steel enclosure provides full protection against dust and water. The PXR Series small character inkjet printers will inherit the same features with further enhancement such as work shift code printing and time base count printing. New features will make factory operation much easier and help improve traceability in the production. With its IJP- RST1 option, PXR small character inkjet printers can easily have Ethernet® connectivity at an inexpensive cost which will further improve production efficiency.